Harvey, downgraded to a strong tropical storm, continues to pound Texas while our threat remains fairly low. The computer "spaghetti" model forecasts as they're colloquially known look exactly like a clump of spaghetti thrown against the wall, almost like a proverbial dart board. 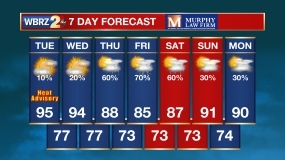 Each line represents a single computer model's forecast. As you can see from the image above, there is no uniform agreement. Thus, the National Hurricane Center Forecast is having a very difficult time creating a forecast with very high uncertainty. What they all seem to show though, is that Baton Rouge is well displaced from the brunt of the storm, but we will likely still be influenced slightly, in the way of rainfall. The storm has dramatically weakened, however because of its vicinity to the Gulf of Mexico, it will still continuously pull in moisture from the Gulf. It then becomes similar to our scenario last August where a system tropical in nature dumps rain over the area, but without the force of hurricane winds. It will likely remain at tropical storm-force strength however for several days. Our projected rainfall totals will be much more modest, ranging from four to seven inches through the entire week. This is something that we can definitely handle. 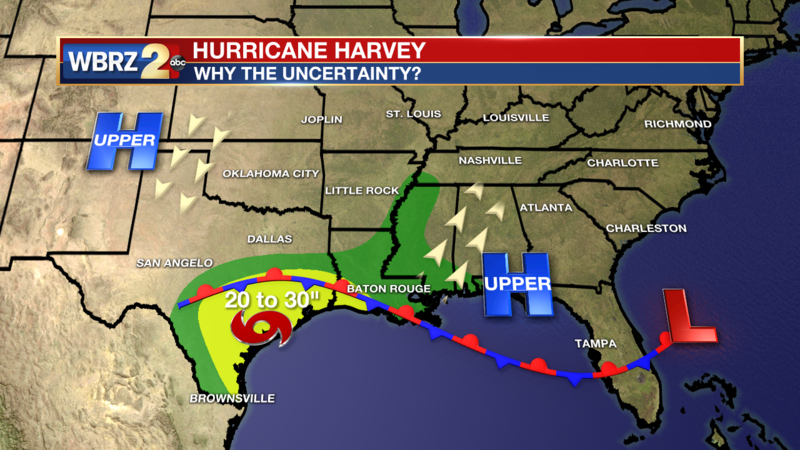 The reason for the large uncertainty lies within the battle for control of the strong high pressure in the western United States, and the high situated in the Gulf of Mexico. As these highs remain present, the storm will remain quasi-stationary. Until one of these gives, then we'll start to see the effects of some steering of this storm. The most likely scenario is that the western ridge of high pressure will gain control and eventually push this storm westward into Mexico or possibly northwestward further into Texas where it will finally die. Before that happens though, it will meander around the Texas coast ultimately influencing our weather pattern, bringing scattered showers and thunderstorms from day to day. Again, August flood levels are NOT expected, and area rivers will be able to handle the amount of rain we are to receive. 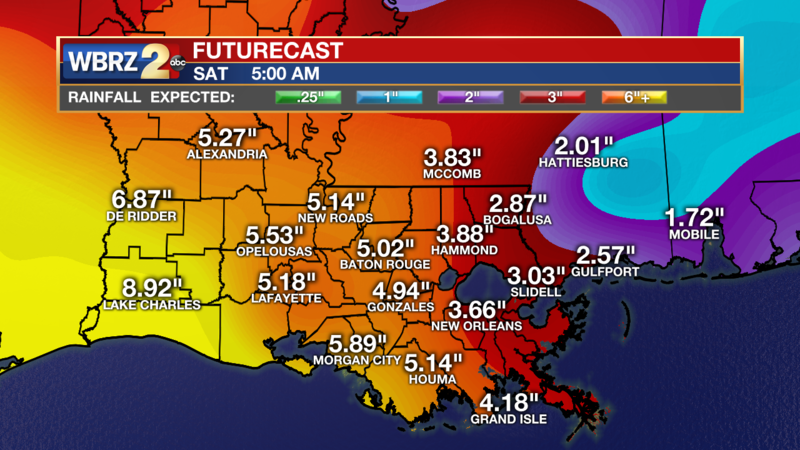 The best chance of rainfall lies to the south and west of Baton Rouge. At most, only minor flooding is possible, or localized street flooding from passing downpours. 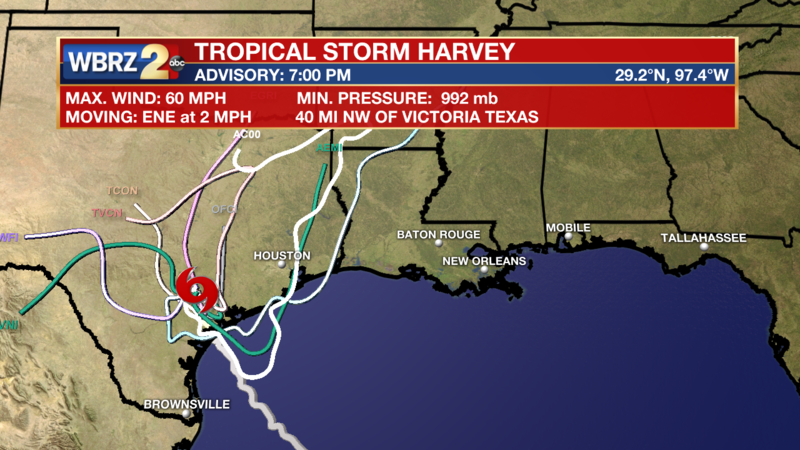 In a nutshell, southeast Louisiana is likely spared, but vigilance is necessary as the system continues to thrive in south Texas.